I consider myself a geek. I love geeking out over numbers and in Real Estate there is no shortage of numbers to geek out over. For those of you that have read or watched my market updates in the past, you know that one of the indicators I like to watch is “Months of Inventory”. This can help you figure out if you’re in a balanced market, a seller’s market or a buyer’s market. In general, 0-3 months worth of inventory is a Seller’s market, 3-6 months of inventory is a balanced market and anything over 6 months worth of inventory is a buyer’s market. Many of you will remember our buyers market was defined as 2008 – 2011. Real Estate is cyclical. After having done this now for close to 14 years, I’ve seen the cycle. I’m working on my second one. I watched as the market ran up 2003 – 2006 . . . fell 2007 – 2011 and have been watching it rise since 2012. Change IS in the air my friends. No one can accurately predict when that change will come, but it will come. Some people think it’s already starting, and in some areas of the country, they may be right. Some people think it’s a year or two away. Regardless the change will come. The other thing Real Estate is, is local. I have a client who’s home was on the market for 30 days before she received an offer. She was stressing and calling me nearly every day saying “When are we going to get an offer?” and “My neighbor’s home sold in 6 hours” and “My friends told me their neighbor’s home sold in a day”. Of course no one is saying “My home took 3 months to sell” or “I tried selling and couldn’t”, but those two scenarios are just as likely and the others. NEWSFLASH: Every house doesn’t sell. Every house doesn’t sell in 1 hour or even 1 day or heaven forbid, even 1 week. In the case of my client, average market time for homes in her area in her price range was 28 days. We got an offer on day 31. When I say that Real Estate is local, I mean it’s local. Your neighborhood, is different than the next neighborhood over. Your home even though it might be the “same” as your neighbor’s is different. When you say “They got an offer in 6 hours” what were “They” selling? Right now in Pierce County, if you have anything relatively nice under $250,000 you can probably expect it to sell fairly quickly. If “Their” home was a 3 bedroom 2 bath home for $235,000, priced well, staged well in a desirable community and school district, it probably DID sell in 6 hours. But you can’t compare that to a home that’s listed for sale at $450,000. They are two different animals. The pool of buyers for a $450,000 home is smaller than the pool of buyers for a $235,000 home. It’s just a fact of economics. 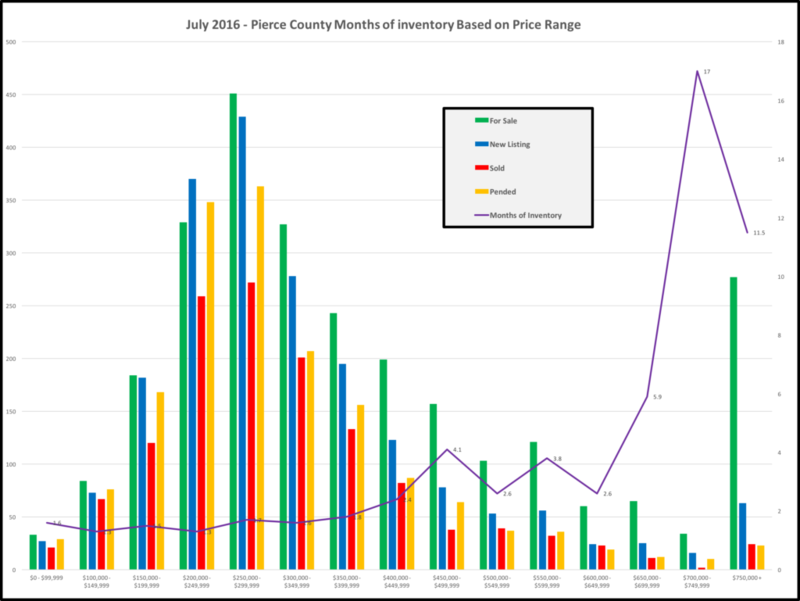 So what I did was put together this handy chart showing you what inventory levels are like in different price ranges for ALL of Pierce County. Again, Real Estate is local. So if you happen to have a $235,000 home in Pierce County, that doesn’t mean that where your home is has exactly 1.3 months worth of inventory. Elbe for example will have more months of inventory than University Place. People are lining up to buy homes in University Place, people pass THROUGH Elbe on the way to Mount Rainier. (Sorry to both of you that live in Elbe and are reading this) Real Estate is Local. Real Estate is Cyclical. If you want specific information for YOUR home, let me know and I’m happy to put together a personalized report just for YOU. Notice that as you get above $400,000 in Pierce county, inventory starts to rise. As a side note, I did this same analysis in King County and not until you get above $1,250,000 do you have more than 2 months worth of inventory. Crazy town. It’s a Seller’s market in every price category up through $1,500,000 . . . which is where I stopped because I didn’t want to make myself throw up. 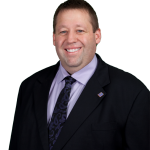 John has been a licensed Real Estate Broker and Realtor in the state of Washington since 2003. He's earned many professional designations such as the Certified Residential Specialist, Graduate of the Realtor Institute and the Accredited Buyers Agent. When John isn't assisting buyers, sellers and investors, you'll find he and his wife flying around the Puget Sound taking full advantage of John's private pilot's license. When they're not flying, they're likely hiking, snowshoeing, really just enjoying all the great northwest has to offer! Great read! I look forward to the next!